Diabetes currently affects 26 million Americans and is approaching an epidemic in the USA. At current rates, according to the CDC, 1 in 3 Americans will have diabetes by 2050. 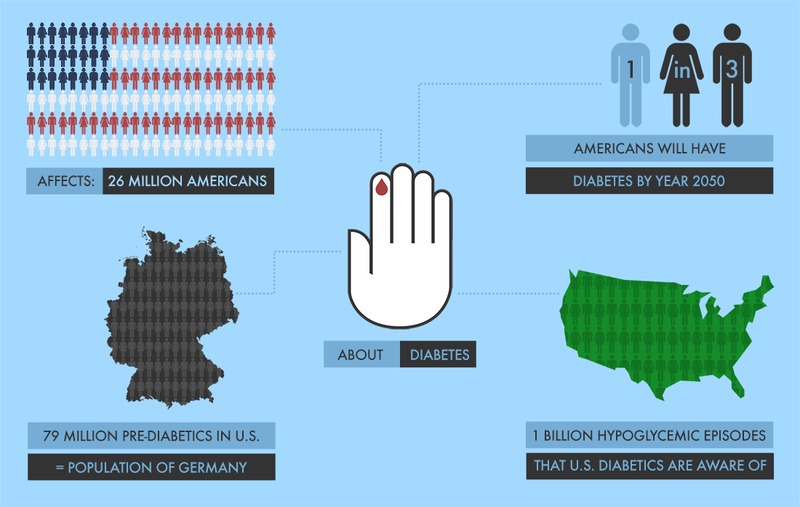 Currently 79 million Americans are pre-diabetic. Our own research with American diabetics uncovered that they are personally aware of experiencing approximately 1 billion hypoglycemic episodes per year. The actual number is likely much higher due to unawareness. Diabetes is a group of diseases characterized by high blood glucose (blood sugar). When a person has diabetes, the body either does not produce enough insulin or is unable to use its own insulin effectively. Glucose builds up in the blood and causes a condition that, if not controlled, can lead to serious health complications and even death. The risk of death for a person with diabetes is twice the risk of a person of similar age who does not have diabetes. For more information about diabetes and diabetes management, CLICK HERE to refer to the American Diabetes Association.